Do not be fooled by those old high school class rings that contain synthetic Spinel, into thinking this is the flagship for all Spinel: this could not be further from the truth. Beauty, rarity, value and brilliance make natural Spinel a great addition to anyone's collection. As public awareness increases, Spinel prices continue to rise. In fact, discovery of new deposits in Tanzania bring very hefty price tags, especially 'Candy Apple Red'. This is a great time to invest in this gem of a gem! Blue Oval Sapphire Ring with Diamonds - 1.3ctw, 14 KT - GREAT DEAL! 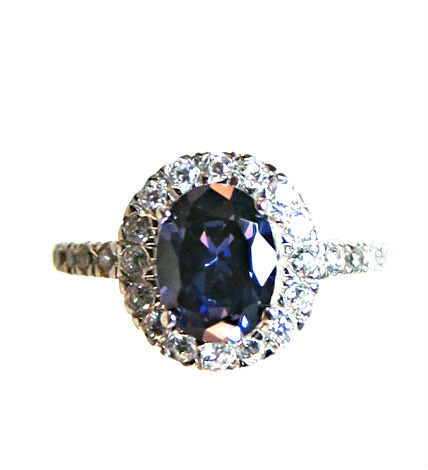 Click the button below to add the Blue and White Spinel Ring to your wish list.